Q.1 What should I do if one evaporation boat fails during the cycle? Breaking the cycle and replacing one boat causes a lot of wastage. Ans. As the roll of thin film moves from one end to the other inside the vacuum chamber, it moves over sets of evaporation boats that are clamped at intervals. Engineers handling the vacuum deposition keep an eye on the entire process through sight glass provided on the chamber walls. In case he sees that one of the boats has failed during operation, the best course of action for him will be to increase the power and wire feed of two boats adjacent to the failed one. 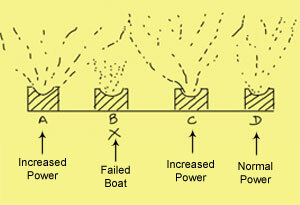 As shown in the diagram(a), for example, if in a set of boats, boat B fails then power and wire feed to boat A and C should be increased. This will cause a bigger fountain of vaporized metal to emerge from these boats, which will compensate for the loss of evaporation from the failed boat- B. This can save wastage of film, loss of time and power for breaking vacuum and replacing boat and then starting all over again. Q.2 There are 2 and 3 Component Evaporation Boats. What’s the difference between them? Ans. A two component Evaporation boat is made of Titanium Diboride (TiB2) and Boron Nitride (BN). A three component boat is made of Titanium Diboride (TiB2), Boron Nitride (BN) and Aluminum Nitride (AlN). A three component boat is marginally cheaper than a two component boat but its life is also shorter than a two component boat by almost 25%. Therefore, people generally prefer a two component boat for better performance and their money’s worth. Q.3 How can I get more life from evaporation boats used in metalizing? Ans. Life of evaporation boats can be increased by about 25 percent if operating parameters are optimized. I have written an article earlier on this topic. Click here to read it. 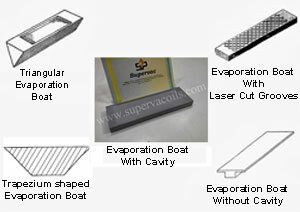 Q.4 Evaporation boats are of various shapes. Which one is most economical to use? More than 99% Metallizers, world over use rectangular evaporation boats with cavity. Q.5 What is the difference between dimet evaporation boats and trimet evaporation boats? Ans. Dimet boats are made of titanium diboride as conducting element and boron nitride as insulating element. 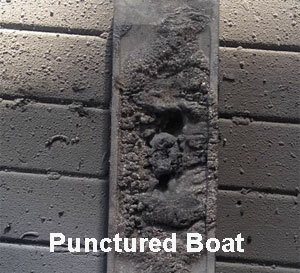 In trimet boats part of boron nitride is substituted by aluminum nitride to reduce cost. Although 3 component boats are cheaper than 2 component boats, they give a shorter working life. Q.6 How are evaporation boats made? Q.7 What are BN boats that are used in a metallizer? Ans. BN boats are nothing but normal evaporation boats. Some people (mostly Chinese) call evaporation boats as BN boats because evaporation boats have boron nitride powder as one of its constituents. Normal evaporation boats are also known by the name of ceramic evaporators. Q.8 Why should graphite foil be used at the boat ends? Can I use ordinary graphite foil? Ans. Boats are given current through copper clamps. This current flows at very high amperage. Neither the surface of clamp nor the surface of boat is perfect. So contact between the two leaves small gaps. These small gaps cause sparking which results in (a) wastage of electricity (b) overheating of copper clamp causing it to break or warp and (c) damage to boat. 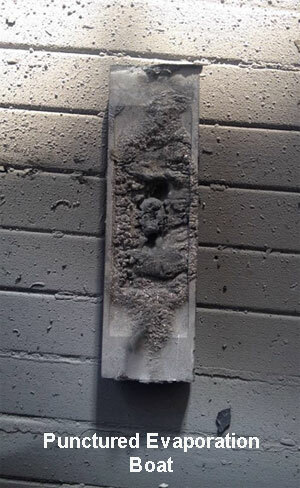 To prevent this, graphite foil is used; graphite being conductive in nature. Graphite foil is a thin paper like material made up of highly compressed graphite. It is wrapped around the ends of boat and then fitted into the clamp. Graphite foil of myriad qualities are available in the market. Sometimes just to save money, low quality plumber grade graphite foil is used. But it is not advisable to do so. 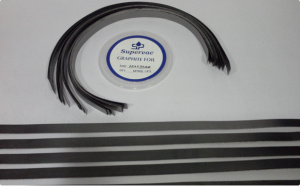 These low quality graphite foils have low compressibility and many additives like binders and adhesives in them. Conductivity of this low quality graphite foil is poor causing overheating. Also on getting heated, these binders release vapors into the vacuum chamber which can adhere to the substrate as impurities. Good quality graphite foil will ensure proper electrical contact between boat and the clamp and will be free of binders and adhesives. Supervac is manufacturer and supplier of high quality graphite foil SV-GF. It is manufactured specially for the vacuum coating industry by a patented process of exfoliation. Q.9 Why is it important to heat the boats slowly for first use? Ans. New boats invariably have some moisture. If boats are heated slowly this moisture turns into steam and escapes through the pores of the boat. If boat is heated fast then moisture (turned into steam) will have no time to escape and pressure buildup can cause the boat to crack. Q.10 My ceramic boats puncture very quickly. Any remedies for this? 1) You may be using very hard aluminum wire. 2) The rate of feed for aluminum wire is too fast. Use tempered aluminum wire and/or reduce the wire feed speed to solve this problem.